The goal of a balanced literacy approach is to create skillful readers and writers. Classes use shared texts and independent reading to practice specific skills and strategies. Reading and writing are integrated; students analyze, discuss, and compose texts as both readers and writers to compose literary essays, narratives, and expository non-fiction pieces. Students develop their critical thinking by writing about their reading and participating in constructive conversations. They also learn to listen with purpose, share ideas, and grow their thinking together. Incorporated into this approach is the understanding that writing must be clear for an audience; this includes attending to spelling, grammar, and penmanship. 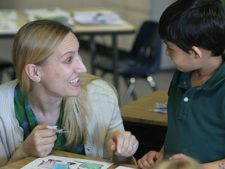 In Singapore Math, students deepen their understanding of the base ten number system in order to flexibly manipulate numbers and compute efficiently. Goals include learning to multiply and divide large numbers by a single digit, representing the relationships between operations symbolically with bar diagrams, and using the methods and vocabulary to effectively communicate solutions including the ability to discuss and analyze their work for correct logic and procedure. Students in third grade begin to formalize their use of the scientific method by keeping a lab notebook to record their work. They explore life cycles of flowering plants and insects by raising plants and using bees to cross-pollinate. Students take core samples to obtain soil profiles, comparing and classifying properties of different soils. They discover the properties of air and water under compression and learn the applications in everyday life. Measuring the movement of shadows and learning to use thermometers helps them make observations about differences between shadows and sunny areas. Third graders experiment with the heat absorption properties of black versus white objects. Students study the history of Ancient Rome, Europe and the Middle East in the Middle Ages, and the Age of Exploration. They build their background knowledge and make connections with history through discussion, reading multiple sources, projects, mapping, drama, and essay writing. Students explore each culture through a variety of view points: culture, society, location, people, transition, and constancy. The goal of the Spanish program is communicative competence in speaking, listening, reading, and writing. Third graders build vocabulary, work on sentence construction, and begin to work on conjugation. Emphasis is on building vocabulary using children’s poetry, songs, and role-playing. Topics include classroom objects, adjectives, the calendar, numbers, classes and activities, season and weather, likes and dislikes, states of mind and states of being, age, telling time, expressing opinions, and the family. Throughout the year, students are introduced to the various cultures and regions of the Spanish-speaking world, including units on Cinco de Mayo, Día de los Muertos, and Christmas celebrations. Third grade uses the book “Viva el Español – Hola”. Students begin a broad introduction to the Baroque and Classical periods in music history, studying composers, styles, and forms of music, and listening to many musical examples. Students continue to improve their ability to read notes from the grand staff and apply rhythmic counting during theory class using various instruments, voice and body percussion, and then put these concepts to practical use during weekly partner piano lessons. Once weekly choir class offers students the opportunity to analyze music pieces, practice sight-singing and aural skills, and learn how to read from choral scores. Students will prepare for twice yearly piano recitals, twice yearly choir/orchestra concerts, and the optional graded examinations of the Associated Board of the Royal Schools of Music, London. In third grade, students are able to begin strings (violin, viola, cello) with twice weekly instruction. Students observe how the basic elements of art, lines, color, light, shadow, texture, pattern, etc., work together to please viewers, to show emotion, to tell a story, or to give viewers a new way of looking at something. Students learn volume drawing, recognize and duplicate positive and negative space, practice still life drawings and paintings, and sculpt in both clay and paper maché. The program emphasizes physical skills that can be applied in multiple sports situations. Through games and drills, students learn basic skill development, fine and gross motor movements, spatial awareness and basic strategy. Confidence and motivation to participate in organized and individual physical activities develops. Students learn leadership, teamwork and good sportsmanship while emphasizing lifelong fitness.